Today is a special post on the most important meal of the Chrono Diet: the BREAKFAST! Yes, if you skip it, you literally ruin your diet day because your will get so hungry in the evening that you will eat whatever you find! Eat your breakfast before 8 am; it is very important to follow the chrono biology, which is how your body works during the day. Your body will assimilate very fast and use the animal fat contained in the cheese to rebuild your cells. Take you height in cm, remove 100 cm and divide it by 2. You have the grams you need. It is a very small amount of bread. Your body does not need more than this. This bread must not contain any kind of sugar. Please check on the package! 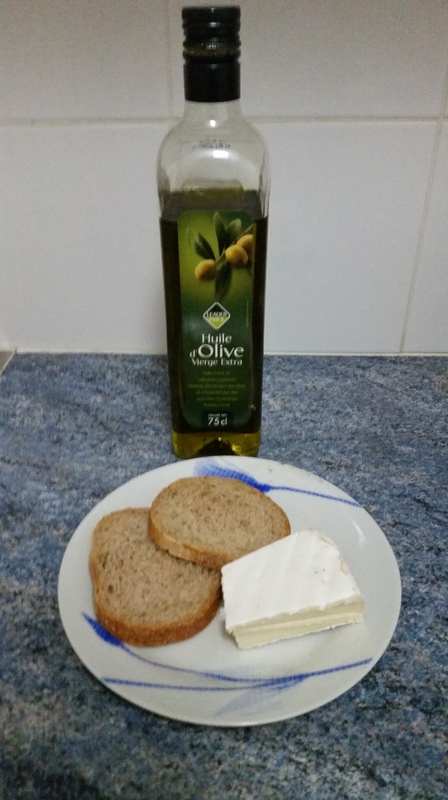 Pour a little bit of olive oil on your bread to make it tasty. Take your height in cm and remove 100 cm. You have your quantity of cheese in grams. This seems a lot but it is what you need to get full up until 12 or 1pm for your lunch. Important note: cheese contains 10 times more calcium than milk or yogurt. Please leave your comments below and share your thoughts, or where to buy bread with no sugar in your country please!!! For more details on Breakfast, check out Dr Delabos’ video on Why the breakfast is a must that I translated for you.